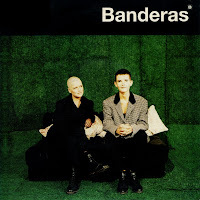 Banderas appeared on the scene with 'This is your life', then followed up that single with 'She sells' and the debut album 'Ripe'. That was just about the extent of my knowledge circa 1994, when I suddenly found this single. 'May this be your last sorrow' was a great track from the album, so I was happy to buy this disc - especially since the B-side contained a non-album track, 'Nice to know'. I have no idea what happened next with Sally Herbert and Caroline Buckley. They disappeared from the scene, unfortunately. Great work with the blog. Keep it up.